Home Internet What is HTTP and HTTPS? What are the Benefits of HTTPS? What are HTTP and HTTPS? What are the Benefits of HTTPS? 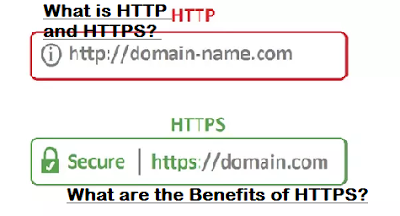 Hello friends, welcome to my Blog, today we are going to talk about HTTP and HTTPS and what are the benefits of https. HTTP is the full name hypertext transfer protocol. This is a protocol that works to send data between your browser and the website. And the https complete name is Hyper Text Transfer Protocol Secure. The 'S' inside https means 'secure', which means that all communications between your browser and the website have been secured. https is often used to protect highly confidential online transactions such as online banking and online shopping order forms. The security of HTTP is very weak. Because of which it can be hacked. The security of the https is very strong and it is very difficult to hack. That is why all websites doing highly confidential online transactions such as online banking and online shopping order forms use https without using HTTP. Whenever you have a go on a website where you provide your banking details or give your Personal details have to be put before the https in the URL of the website you let the course Czech. It is very easy to check if any website has been handpicked. When do you open a website, your browser lets the visible URL up to the website if someone wrote before Httpः the URL of the website received a green met icons of locks or received written Secure green This means that the website is secure. What are the benefits of https if you have a Blogger or have a website you need to use HTTPS. By using HTTPS, your website and your posts or articles will come first in the Google search result as Google gives more importance to the https result. Apart from this, your visitors remain dependent on you. 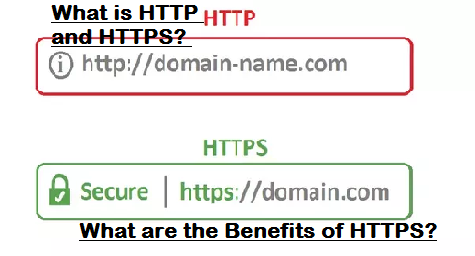 If you have an e-commerce website then you should always use https Because the https for the e-commerce website is very important as it is an online transaction and here it is necessary to carry the user information in the encrypted format to the server so that no third party or hacker steals that information. So if you have an e-commerce website then you must use https. Friends, if you like my post then please share my post with your friends and also follow my Google+ Account. Thank you.